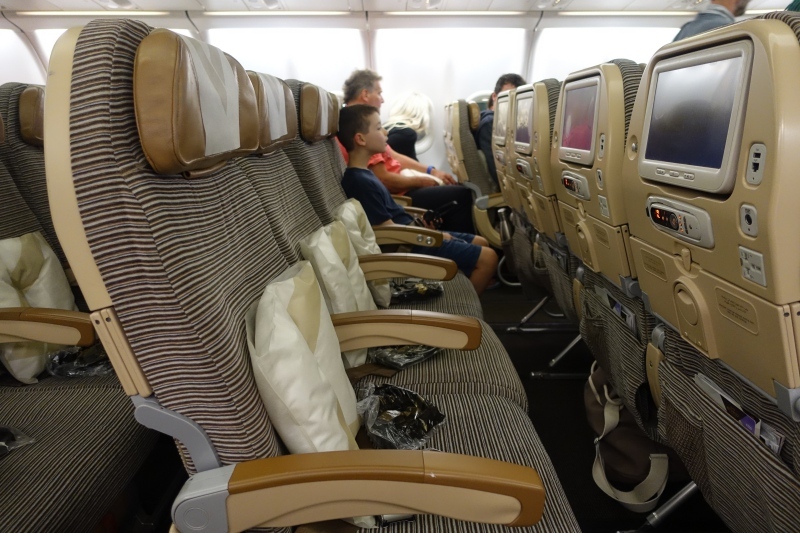 This review of Etihad Economy Class on the A330-200 from Male, Maldives to Abu Dhabi is part of our recent return trip to the Maldives, including Etihad First Apartment on the A380, Emirates First Class, and a stay at Cheval Blanc Randheli. See all of our posts tagged Etihad Airways. Although we'd reserved Etihad First Apartment between Abu Dhabi and New York JFK, there was only 1 business class award seat available on the Male to Abu Dhabi segment, so we gave that to my husband, as the tallest in the family (his review forthcoming), while my son and I flew in economy class. 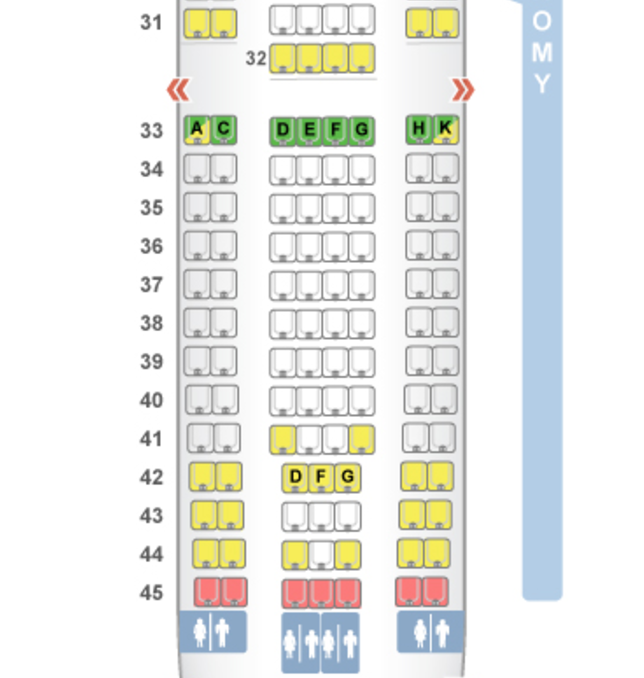 Etihad's A330-200 has 240 Economy Class seats in a 2-4-2 configuration (except for the last 4 rows, 42-45, which are in a 2-3- configuration). 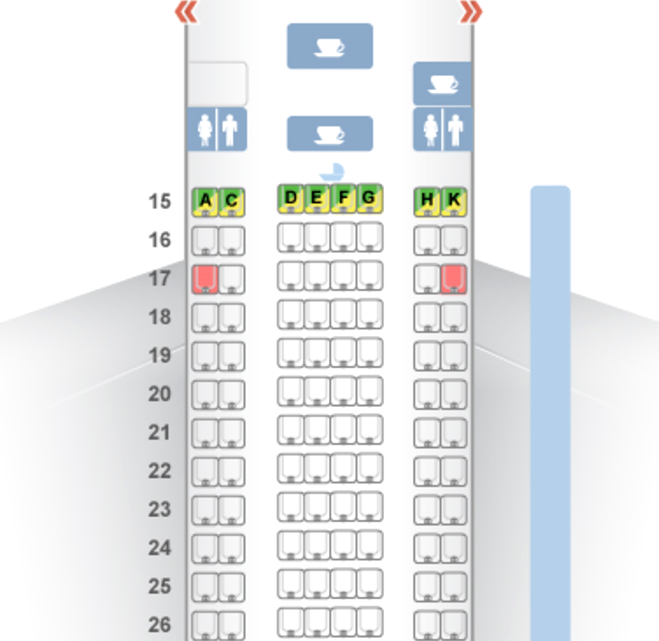 If your goal is extra legroom, you'll want to get to the airport early to see if you can be seated in the bulkhead row 33 of the second Economy Class cabin, particularly seats 33C, 33D, 33E, 33F, 33G and 33H (window seats 33A and 33K are slightly obstructed by the exit door). In our case, my goal was to try to get a whole middle row for ourselves so that my son could sleep on the flight, since it departed at 7:30pm, arriving in Abu Dhabi at 10:55pm, and his normal bedtime is 8pm. So a few days before the flight, I reseated us from our original seats in the forward economy class cabin to seats 42D and 42G, which at the time was an empty row, hoping that no one would want the middle seats , 42E and 42F. Fortunately, while our flight was very full, no one was seated in those seats, so we did have a row to ourselves and my son was able to stretch out and sleep most of the flight. Naturally we were taking a risk, but the good thing about selecting two aisle seats is that you're more likely to find someone to switch with if the middle seats are taken. Etihad's Economy Class seat is a half inch wider than Emirates, at 17.5 inches to Emirates' 17 inches, although to put it in perspective, this is still narrower than JetBlue's 18 inch wide seats. And Etihad Economy Class seat pitch, at 31.5, is half an inch less than Emirates Economy, which has 32 inches of seat pitch, and both have less than JetBlue's A321 transcon, which has 33 inches of seat pitch in regular economy, and 37-41 inches in its Even More Space seats. Because of the fairly narrow seats and limited seat pitch and recline, I personally wouldn't want to fly Etihad Economy on anything much longer than our 4.5 hour flight, or on a red eye, but for our flight it was perfectly fine, especially given that we had a whole row to ourselves. 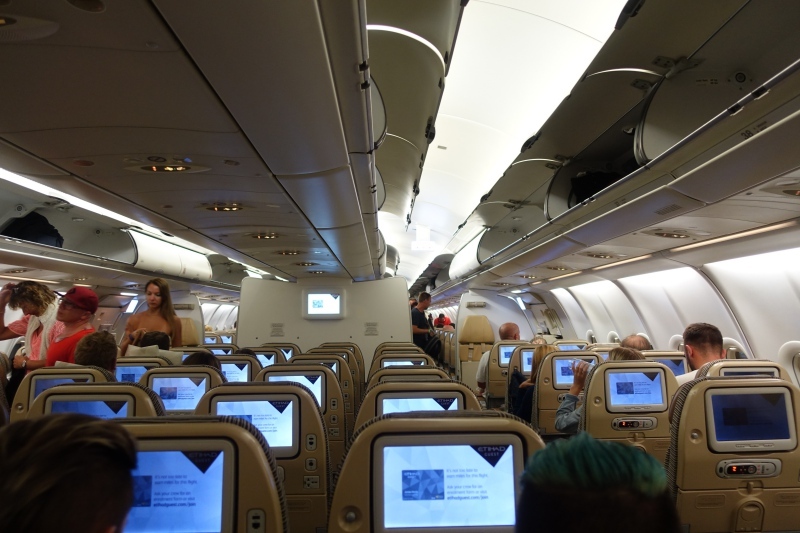 Aesthetically, as economy cabins go, the cabin looked quite fresh. 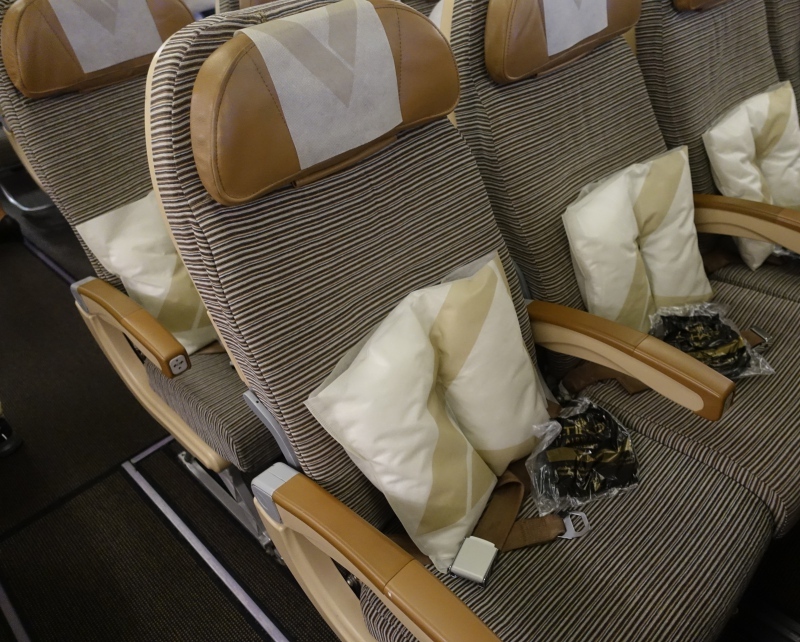 Seats are in a neutral and subtle black, tan and white striped color scheme, with tan accents, and each seat had a pillow and packaged headsets on it. 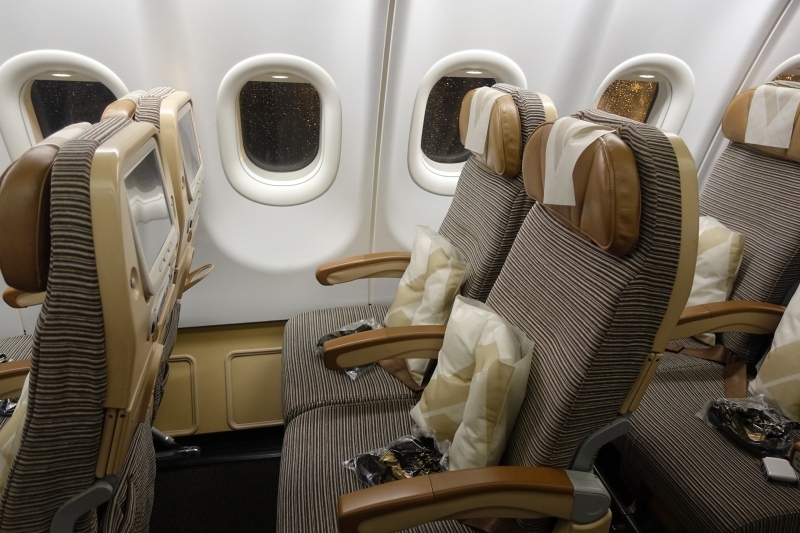 The seat backs have the IFE control as well as the TV screen, and also a power outlet, which is a convenient location, rather than having to hunt around the lower part of your seat armrest, where it often is. 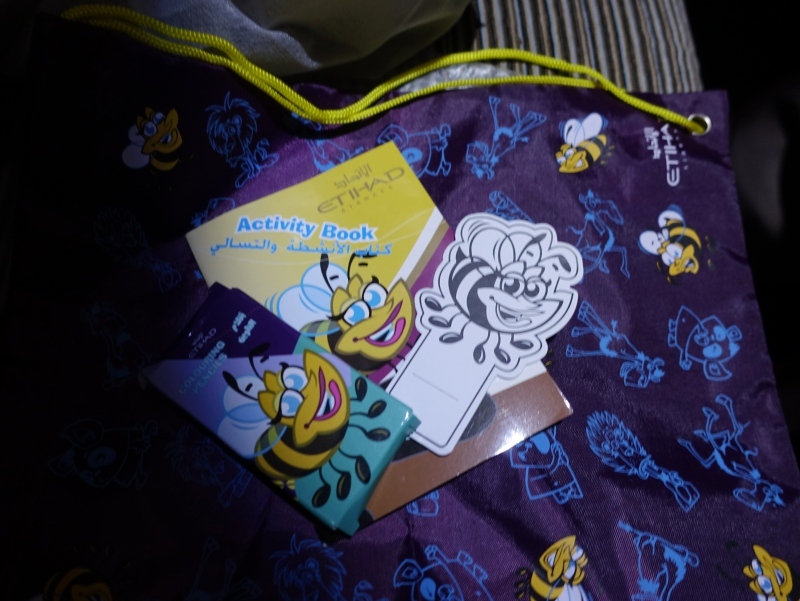 One of the crew members came by with a kids' amenity kit, which included a purple carry bag, an activity book, and colored pencils. The activity book, with its puzzles, came in handy during our layover in Abu Dhabi, when my son was quite wide awake, having slept for nearly 4 hours on this flight. 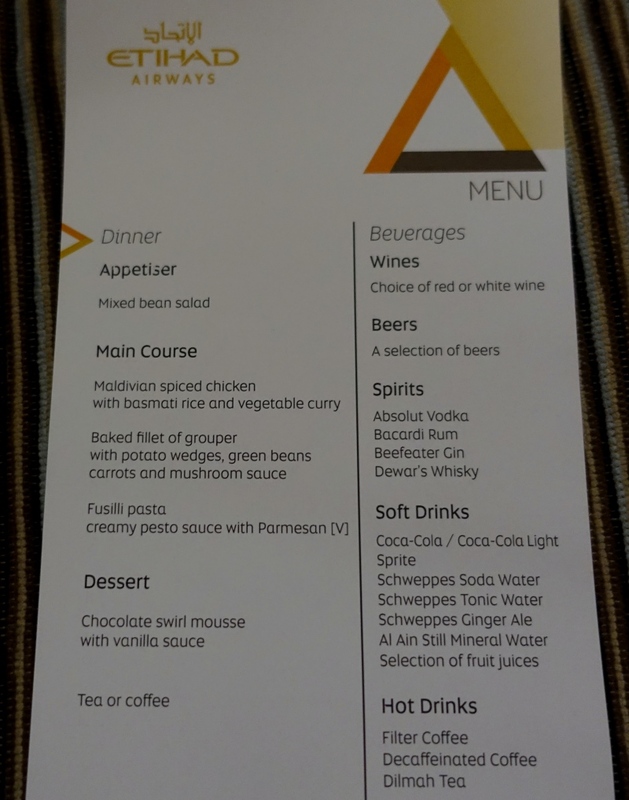 We were given menus before our on-time departure, which offered a chicken, fish, and vegetarian choice, as well as choice of wines, beers, spirits and soft drinks–quite comprehensive, for a 4.5 hour flight. While my son was more sleepy than hungry and didn't eat anything, I decided to try the fish, which was grouper. 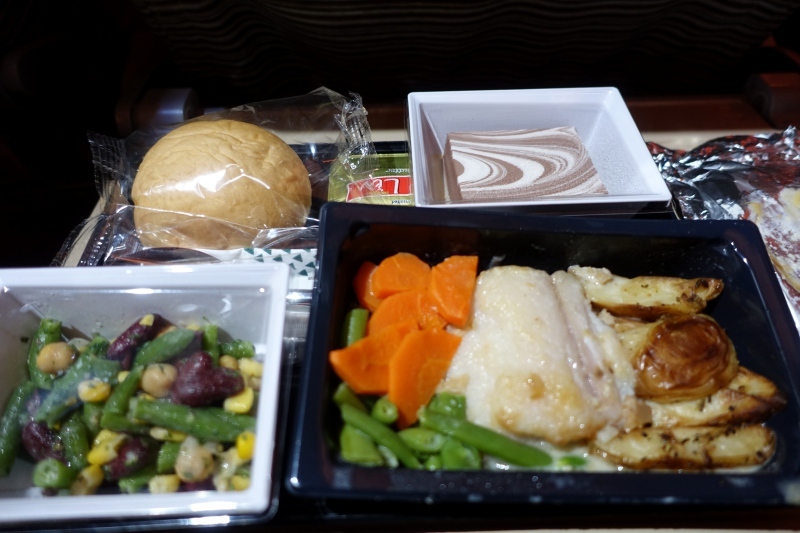 Amazingly, it was fantastic and perfectly cooked–moist and really flavorful, which is unusual for airline fish dishes even in first class, let alone economy. It was so much better than the grouper we'd had at the Park Hyatt Maldives that my husband and son caught on their fishing trip, even though that fish had been freshly caught. It just goes to show how much overcooking spoils even a super fresh fish. The rest of the meal wasn't that good–a very ordinary bean salad, cold bread roll and forgettable dessert–but that fantastic grouper main dish, even though a fairly modest portion, made up for it. Admittedly, we were lucky on this flight to have a whole row to ourselves, and that does make a difference in the experience, especially as a parent traveling with a sleepy child. The Etihad Economy Class seat doesn't recline much (but then, no Economy Class seat does) and I needed help from the flight crew to recline my seat at all, since the control was very stiff. The seat is fairly narrow, but fine for average sized people on a short haul flight such as ours. I liked that the power outlet was in the seatback, which I find a more convenient place for it. The highlight for me was the excellent main dish of perfectly cooked and tasty fish, which I didn't expect. 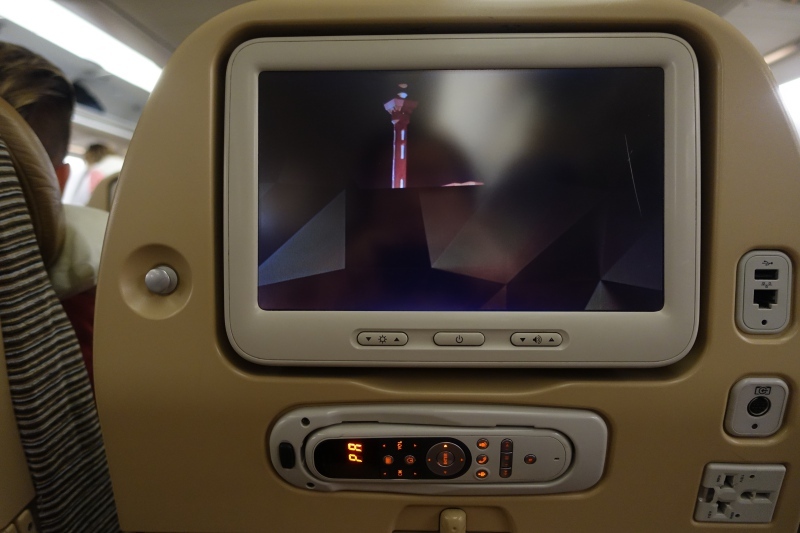 If you've flown Etihad Airways Economy Class on the A330-200, what was your experience?